This concise Companion offers an innovative approach to understanding the Modernist literary mind in Britain, focusing on the intellectual and cultural contexts, which shaped it. 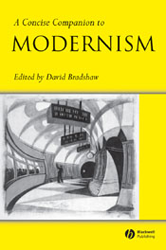 Offers an innovative approach to understanding the Modernist literary mind in Britain. Helps readers to grasp the intellectual and cultural contexts of literary Modernism. Organised around contemporary ideas such as Freudianism and eugenics rather than literary genres. Relates literary Modernism to the overarching issues of the period, such as feminism, imperialism and war.